A biopsy is a procedure where a small piece of tissue is removed from an area so that it can be looked at closely under a microscope. In most cases biopsies are carried out under local anaesthesia (an injection into the area to numb it). The injection takes a couple of minutes to work and means that the biopsy will be painless. The biopsy usually leaves a small hole that often requires stitching. In the majority of cases the stitches used are dissolvable and take around two weeks to disappear. The whole process (local anaesthetic injection, biopsy and stitching) usually takes around 15 minutes from start to finish. When the local anaesthetic wears off after a few hours there is relatively little in the way of pain or swelling. Occasionally it is necessary to take simple painkillers (eg Paracetamol, Nurofen). Usually any discomfort only lasts a few days. 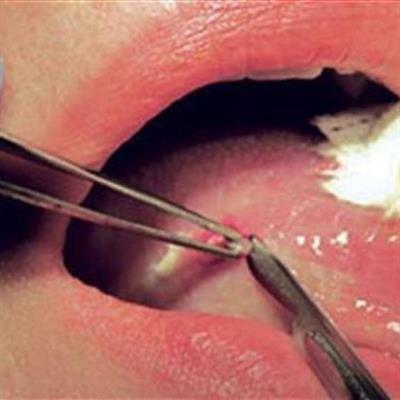 Although there may be a little bleeding at the time of biopsy this usually stops very quickly and is unlikely to be a problem if the wound is stitched.Should the biopsy site bleed again when you get home this can usually be stopped by applying pressure over the area for at least 10 minutes with a rolled up handkerchief or swab. If the bleeding does not stop please contact the department. Be careful not to bite numb areas of your mouth. On the day of surgery you should avoid rinsing your mouth out vigorously as this may cause bleeding. You should clean your teeth normally, including those teeth next to the site of the biopsy. If you find that food catches around the stitches then the area can be gently rinsed with a mouthwash or warm salt water (dissolve a teaspoon of kitchen salt in a cup of warm water) commencing on the day after surgery. Since the stitches are dissolvable a review appointment is not always necessary but you will usually be given one so that the results of the biopsy can be discussed with you.